This summer, Dairy Queen is bringing back two fan-favorite menu items from the '90s with the re-release of the Treatzza Pizza now and the Misty Slush starting June 26, 2017. Both items are permanent additions to the menu. 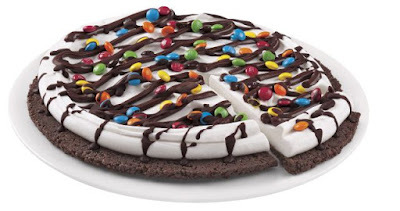 The Treatzza Pizza features a crust made of fudge cookie crunch that's topped with the chain's vanilla soft serve, your choice of candy pieces (options include Choco Brownie, Reese's, M&M, and Heath), and a chocolate drizzle. Each Treatzza Pizza is cut into eight slices designed to serve eight people, providing a smaller ice cream "cake" option. The Misty Slush, formerly known as Mr. Misty, is a fruit-flavored slush that comes in the following flavors: Cherry, Blue-Raspberry, Grape, Strawberry-Kiwi, and Lemon-Lime.